Take a second to find out what's happening with Local #35 and Marin County. Being the oldest local union west of the Mississippi River, Carpenters Local #35 has been a fighting force for workers rights, organization, and equality for over 130 years. We are located in beautiful San Rafael, California and cover the entirety of Marin County. 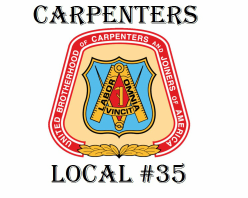 Carpenters Local #35 is an affiliate of the United Brotherhood of Carpenters & Joiners of America, Northern California Carpenters Regional Council, as well as the Marin County Building Trades. We also offer California approved Carpenters Apprenticeship Programs as well as Journey Level upgrade classes through the Carpenters Training Committee for Northern California, located in Fairfield, California. ©2015 Carpenters Local #35. All Rights Reserved.